This recipe comes from Usborne's Beginners Cookbook. One of my kids received this as a present once from one of my friends. The biscuits look and taste messy and homemade. 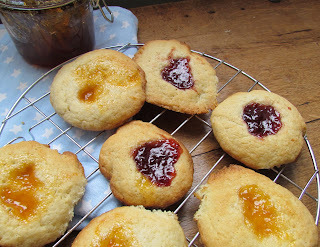 And there is something really satisfactory about the jam bubbling all over the biscuits while they are in the oven. Preheat the over at 200 degrees. Mix the flour and cold butter (cut into small cubes) and rub them with your fingers until they become like breadcrumbs. Add the sugar. Then add the beaten egg with the milk and stir until it becomes a ball of dough. Make small balls with your hand (you will get 16 more or less) and put them over a floured baking sheet pressing them down so that they become like little burgers. Make an indentation with your fingers in ehe middle of each biscuit and put a little bit of jam on top. Bake in the oven for 10 minutes. You need to let them rest on a wire rack for 5 minutes after your take them out of the oven so that they get hard and the jam sets. The kids do most of this on their own but unless you supervise how they put the jam on the biscuits they will make a huge mess, so beware!